What’s happening to screws, and who screwed up? So I was building a workshop on the side of my home — and obviously I was going to need a gigantic quantity of screws. So I grabbed a couple of 5lb boxes of good old Deckmate #8's in various lengths. When I got home, I noticed something odd. In place of the familiar ‘+’-shaped phillips screw head was a six pointed star. This kind of head requires a ‘torx’ bit…which caught me briefly by surprise. But I happened to have a couple of torx heads for my electric screwdriver (my car is built with torx bolts) — and they kindly provided with a free bit with each box of screws. As I proceeded to consume about 10 lbs of screws in my construction work — I started to appreciate why they’d made the change. Over hundreds and hundreds of screws, I had not one stripped head — I could screw in a much longer screw without needing to drill a guide-hole — I could screw and unscrew the same screw repeatedly, and it STILL didn’t strip! It was easier to get the screwdriver into the screw head because it can fit in any of six orientations instead of four — and the torx bit could hold the screw far better onto the bit when I was in need of doing it all one-handed. I was elated! When the familiar phillips head took over from the accursed straight slotted head — it was an enormous improvement, no more slipping screwdrivers and gashed hands! This change is just another great leap forwards, and we can only hope and assume that it’s going to take over fasteners of all kinds over the coming years. To be fair — the phillips driver is DESIGNED to strip the screw head (they call it “cam out”) when you apply too much torque to it so as to avoid damaging the tool — but these days, powered screwdrivers have torque limiters in them, so this really isn’t necessary anymore. Posidriv screws (which look almost identical to phillips) are less likely to strip — but they still do. Trips back to the DIY store showed more screws appearing with torx heads. It seems like an industry-wide technological leap is in progress…quietly, unannounced — but certainly here! 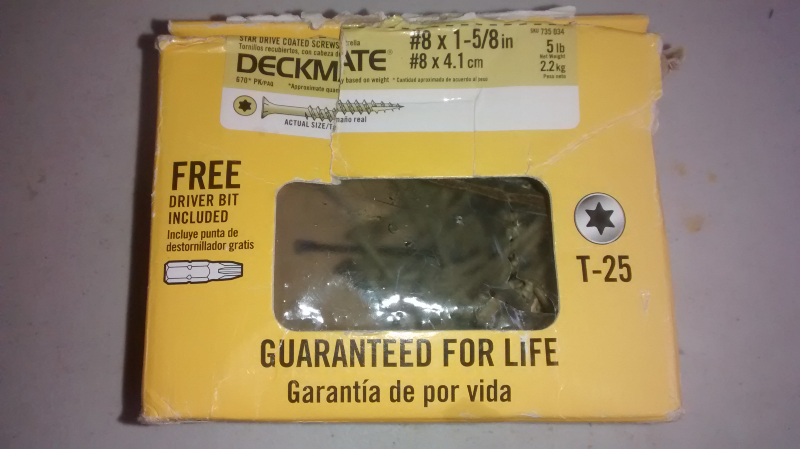 5lb box of Deckmate screws, with T-25 torx heads. So, I set about buying a stack of new, high-quality electric screwdriver bits, hand screwdrivers with ‘T-25’ heads…I’m in on the start of this revolution! 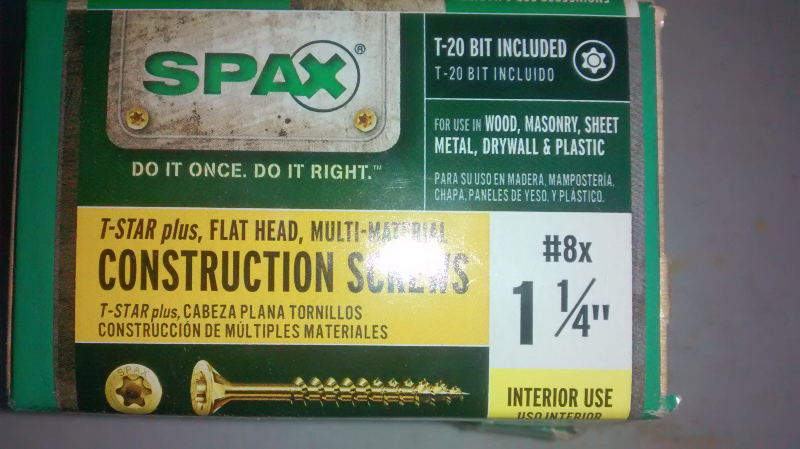 A box of #8 SPAX screws….hmm, they may need to change their logo! How about SPA*…that’s kinda catchy! I get home, grab my sexxiest new T-25 torx headed bit and prepare to slam in my first screw…and the world collapses around me…it doesn’t fit. No, really! Can you imagine that? How could it possibly not fit? This is The Brand New World Of The Future…how could it possibly not fit? It emerges, that in their infinite wisdom, these two screw makers have decided to use different torx head sizes…Deckmate uses ‘T-25’ and Spax has gone with ‘T-20’…the size difference seems small — but there is no way for a T-25 bit to fit into a T-20 slot — and putting a T-20 drive into a T-25 slot gets you absolutely nowhere. Now it’s true that there are variations in the size and shape of phillips slots too, and we have pozidrive as well as ‘true’ phillips bits — but you can almost always ‘get away’ with using slightly the wrong one, and (as far as I can tell) all #8 sized phillips wood screws use the same size of driver. So there we are. The first change in screw technology in 80 years — and nobody got all of the industry screw-makers to sit down together to choose which bit sizes to use for which sizes and applications of screw. Now we’re probably doomed to 50 years of never having the right screwdriver, having to own them in half a dozen sizes — when two or maybe three at most would have done. We’re due for VHS versus BetaMax all over again. Worst of all, it’s very hard to see by eye whether a screw needs a T-25 or a T-20 bit…you pretty much need to try it and see. Now, at this point I should probably go off and research who did this and why, probe into the business case to be made for attempting to lock-in customers to a particular screw bit — to wonder whether some horrible patent war caused all of this…but sadly, I have a shed to build. Welcome to the future folks. Reader Forum: What&apos;s happening to screws? Wow... when I uploaded the photo, all of my text disappeared. Greetings from outside of Austin, Texas. In the last two years we added a deck (shown) to hold a greenhouse (assembly started), built a landing and new stairs of the back stairs (that originally had a 7" step down immediately outside the door), extended a pool deck with curved edge, and covered the newly enlarged deck. It turns out my brother (left in the back) and my handyman (checked shirt) disagree on screws. My brother is a SPAX guy and the handyman prefers Deckmate! My other comment was to strongly recommend that you include a date with each article. I really like to know when something was written.